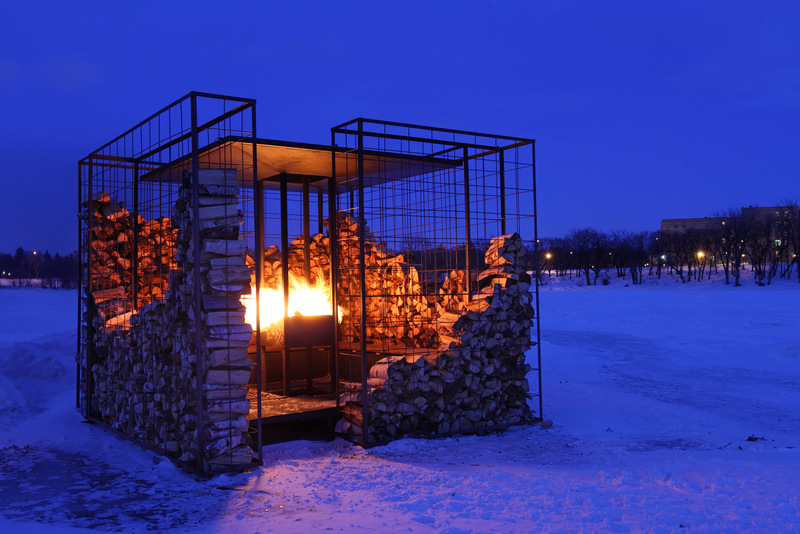 The 'Woodpile' was one of the winning entries is the 2011 "Warming Huts – an Art and Architecture Competition on Ice", and was installed between January and March 2011 along the skating trail at the frozen Assiniboine River in Winnipeg, Manitoba, Canada. The competition, which was held during October 2010, called for collaboration between artists, architects and designers to put forward ideas for temporary shelters that would provide a space for skaters, skiers and strollers to rest along the trail. Starting a fire is the most elementary act of warming. 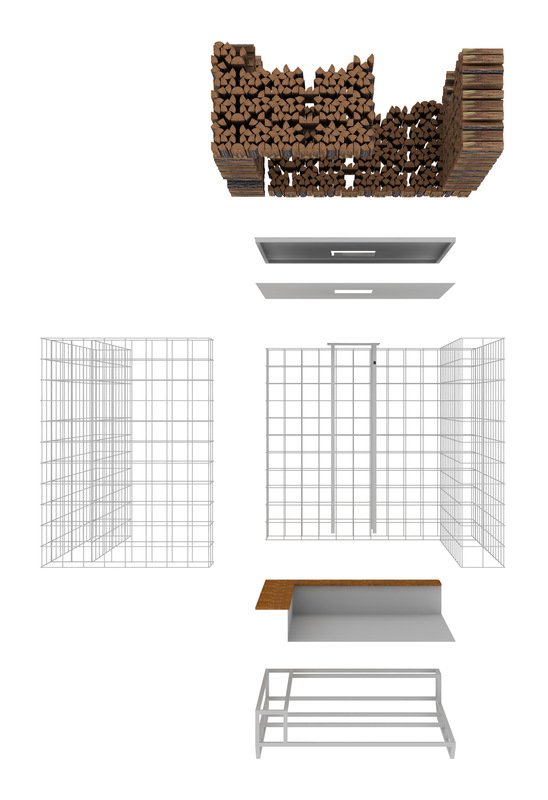 'Woodpile' was designed as an inner space, defined by four peripheral wall frames in which firewood is stacked. 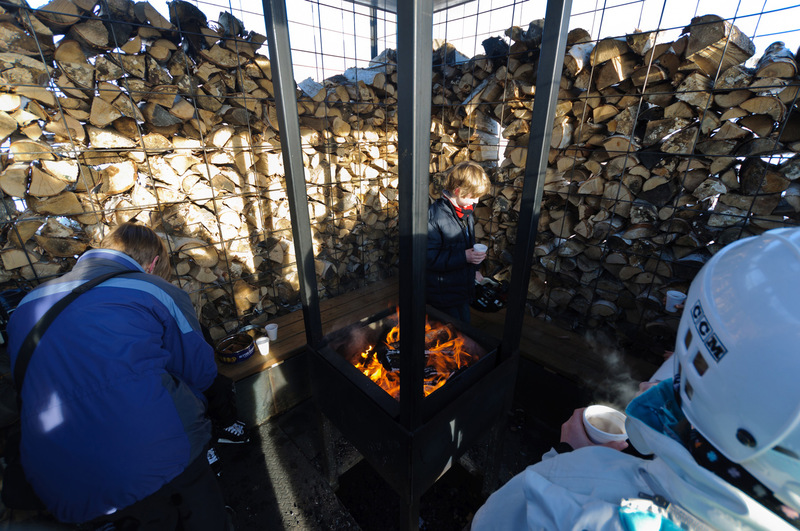 At the middle of the hut, a fire pit was planned to keep the skaters warm. 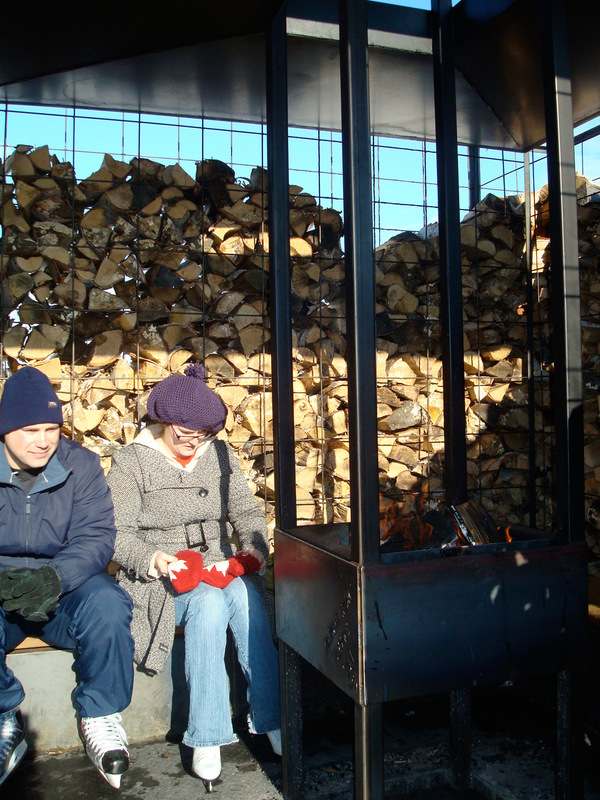 By using firewood as the construction material of the hut, 'Woodpile' serves as a container both for the lighting material as well as for the act of warming. The use of the firewood through the skating season constantly changes the hut's appearance. 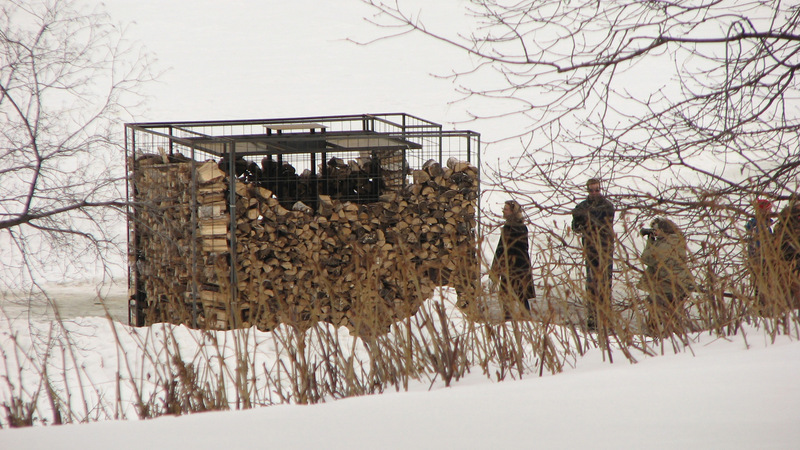 As winter begins and firewood is stacked, the woodpile's level is at its maximum, closing the hut from the surrounding and isolating its inner space from the winter colds. Looking through the cracks between the woods, one can see the campfire being held inside. As spring approaches, the stack's level is lower and the hut's interior space is gradually revealed and exposed to the outside. By summertime the hut’s naked construction could also serve as a shaded pavilion along the river. As we approached the detailed planning for the hut's realization, several adjustments were required. Since the hut was to be located directly on the river's ice, a solution was needed for its removal and storage when the river ice melted. The hut was therefore planned with separate structural elements; including four wall frames plus floor and roof components. All elements, when placed together on site, are connected with simple U-bolts and serve as one structural unit. Furthermore, a central construction of RHS columns was designed to carry and transfer the roof's load through the floor elements onto the ice while simultaneously serving as the roof's drainage system. When speaking about architecture, the term 'performance' usually relates to the aspect of function and the operation of a structure. However, performance also refers to ideas of display and presentation. 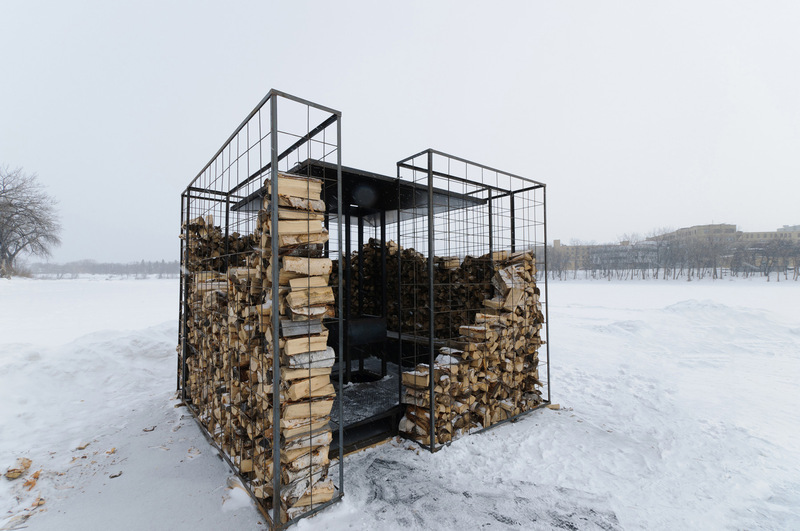 In our design we wanted to express these two notions: As the hut's appearance constantly changes through time, it conceptually turns from a closed and sheltered space during winter to an open structure by spring time. This change reflects the skater's use of the hut so that they play the most significant role in its design.